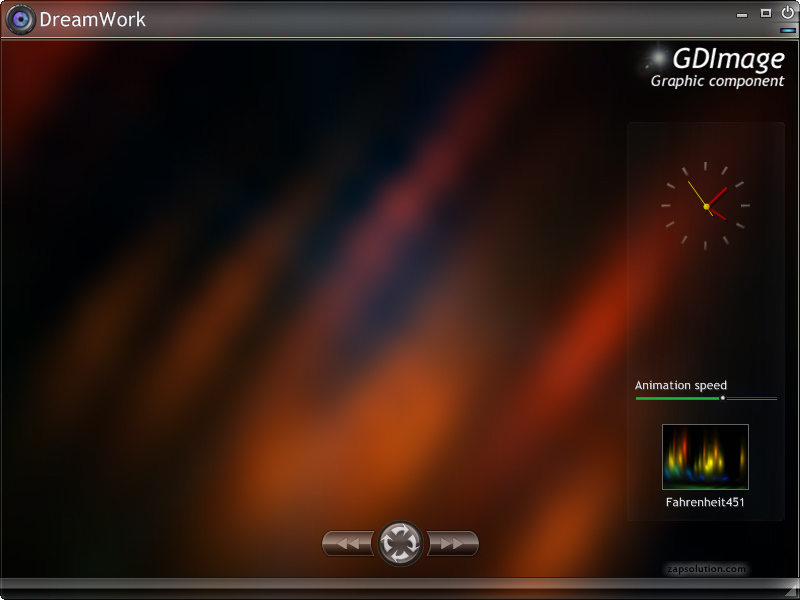 Plasma like animation changing the background of a GDImage composited skinned window. The background animation is fully cooperative with the child controls drawn on the foreground. It works nicely on Windows XP SP2, redrawing works ok, just the clock flickers from time to time. CPU use is around 20% by default, but I have single core CPU Sempron 64bit 3400+, which is not designed to be superfast. I can see a big difference between a single and a dual core processor. The clock shoudn't flicker, because all the child controls are redrawn in composited mode. Anyway the solution could be to use the WM_PRINT message and redraw everything to a private memory DC then use one single BitBlt instead of the classic INVALIDATE/WM_PAINT currently being used.